Roel Koster (kostex) awarded D4704: Linking Embree Libraries Accordingly a 100 token. Roel Koster (kostex) added a comment to D4704: Linking Embree Libraries Accordingly. And I saw too late that @LazyDodo (LazyDodo) came up with that solution on devtalk first... Sorry dude! Roel Koster (kostex) committed rBACa9df5d6e5e19: render_renderslot: classnames 2.80 compliance (authored by Roel Koster (kostex)). Roel Koster (kostex) committed rBAC8007f3811940: object_mesh_versions: classnames 2.80 compliance (authored by Roel Koster (kostex)). Roel Koster (kostex) committed rBACc35e4f3be28e: mesh_selectbuffer: classnames 2.80 compliance (authored by Roel Koster (kostex)). Roel Koster (kostex) added a comment to D3961: Replace deprecated finite() to isfinite(). Regarding spaces.. I told you in my post myself, no need to tell me. I don't know what you mean regarding "upstream"
This proposed patch was just to inform you about a deprecated finite function.. If there is discussion needed to get them out, then count me out.. close the call.. it's not important enough to take up this much time. I bet you got better things to do than these small issues. Roel Koster (kostex) added a comment to T57069: macOS screen scaling wrong on startup. Roel Koster (kostex) removed a project from T58284: Cursor position wrong when edit text on curve: BF Blender: 2.8. Roel Koster (kostex) added a comment to D4234: SVG: Properly handle values in exponential notation. This patch lets me import svg files with exponential notation succesfully! Roel Koster (kostex) abandoned D4078: SVG Import exponential notation filter/fix. Roel Koster (kostex) added a comment to T60468: GPU tiles no longer get denoised. Seems https://developer.blender.org/T60450 reports a similar situation due to that patch. Here's an image of mine showing skipped denoising tiles. Roel Koster (kostex) added a project to T58284: Cursor position wrong when edit text on curve: BF Blender: 2.8. Roel Koster (kostex) added a comment to T60014: PreferencesEdit.material_link not respected. every build since then, up and including 2.80 branch doesn’t respect the setting. just check the behaviour, it’s quite simple to verify..
Roel Koster (kostex) created T60014: PreferencesEdit.material_link not respected. Roel Koster (kostex) committed rBAC61500c707a71: render_renderslot: added forgotten keyword (authored by Roel Koster (kostex)). Roel Koster (kostex) added a comment to D4078: SVG Import exponential notation filter/fix. Roel Koster (kostex) added a reviewer for D4078: SVG Import exponential notation filter/fix: Sergey Sharybin (sergey). Roel Koster (kostex) created D4078: SVG Import exponential notation filter/fix. Roel Koster (kostex) updated the diff for D3979: Make input cursor theme-able. Roel Koster (kostex) requested review of D3979: Make input cursor theme-able. Roel Koster (kostex) added a comment to T55987: 3D Viewport Bug - Ghosting of Geometry - Blender 2.8 d28d202fd1 on macOS High Sierra 10.13.5. Roel Koster (kostex) updated subscribers of T58312: horizontal scrollbar outliner obstructs items. Roel Koster (kostex) reopened T58312: horizontal scrollbar outliner obstructs items as "Open". ok.. this is really getting on my nerves.. sorry that I freak out now, but it’s really just a throw of a dice with trying to inform you about a bug/feature/ui issue/papercut or whatever you think you call something. then it’s a feature, then it’s a bug, always just the opposite of what I think it is..
Roel Koster (kostex) created T58312: horizontal scrollbar outliner obstructs items. Roel Koster (kostex) created T58284: Cursor position wrong when edit text on curve. Roel Koster (kostex) added a comment to D3979: Make input cursor theme-able. Roel Koster (kostex) created D3979: Make input cursor theme-able. Roel Koster (kostex) committed rBACda9984878984: object_mesh_versions: reset y-scale of label heights (authored by Roel Koster (kostex)). Roel Koster (kostex) added a comment to T57770: Vertices visible in XRay/Edit Mode can't be reselected after initial select and transform operation. Roel Koster (kostex) created D3961: Replace deprecated finite() to isfinite(). Roel Koster (kostex) created D3960: ATTR_FALLTHROUGH duplicate definition warnings. Roel Koster (kostex) updated the diff for D3846: Linux List GVFS shares in system folders. Roel Koster (kostex) raised the priority of T57069: macOS screen scaling wrong on startup from Needs Information from User to Normal. It happens on both my own as well as the daily builds. It goes away when I set my "screens have separate spaces" off so I did that in the meantime, but it's not the solution I know. As noted by Campbell, using STRPREFIX makes more sense. Made the filtering a bit smarter/error proof. forgot to include the #include "BLI_fileops_types.h" this last diff. If it doesn't exist no real problem arises. Roel Koster (kostex) added a comment to D3846: Linux List GVFS shares in system folders. it seems that when disconnecting the network, the share entries won't go away and the os will keep trying to look for them when asking for the directory list until timeout. This slows down blender startup while waiting for the timeout..
Roel Koster (kostex) created D3846: Linux List GVFS shares in system folders. Roel Koster (kostex) added a comment to D3838: Ubuntu 18.04 System Bookmarks filter out SNAPS. BTW.. I don't know if this qualifies as feature request, but when starting out with Linux years ago, I always found it difficult to find shares made by Nautilus/Files (UI) in Ubuntu and other distro's. A new user will have that same "where are they in Blender" question. Maybe have them available too? The /run/user/<username>/gvfs folder I mean. Roel Koster (kostex) created D3838: Ubuntu 18.04 System Bookmarks filter out SNAPS. Roel Koster (kostex) updated the task description for T57095: Blender 2.8 Crash on Select Text on Curve. Roel Koster (kostex) created T57095: Blender 2.8 Crash on Select Text on Curve. Roel Koster (kostex) created T57069: macOS screen scaling wrong on startup. Roel Koster (kostex) added a comment to T56909: OSX Mojave wrong interface scaling. Am I right to assume that only the blender 2.8 branch got your (perfectly working ;-) patch? I've incorporated your patch in the master branch myself (personal use) but shouldn't it be in there officially? Still use the 2.79 daily a lot of course. 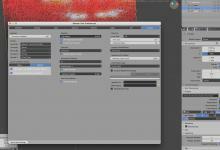 Roel Koster (kostex) added a comment to T56879: Blender2.8 Crash when Editing Text on Curve. Is it on purpose that you did not fix the not showing text on curve before entering edit mode (because blender doesn't crash on it) or indeed forgot to read the original report? In all this time it would only have taken an average blender user maybe 10 seconds to follow my "crash" path..
Roel Koster (kostex) updated the task description for T56879: Blender2.8 Crash when Editing Text on Curve. Roel Koster (kostex) created T56909: OSX Mojave wrong interface scaling. Roel Koster (kostex) created T56879: Blender2.8 Crash when Editing Text on Curve. Roel Koster (kostex) created D3699: Blender2.8 fix SHIFT-A in Curve Edit Mode. Roel Koster (kostex) committed rBAC601ff7ca7b1c: object_mesh_versions: Mandatory Keyword added to labels (authored by Roel Koster (kostex)). Roel Koster (kostex) created D3654: Since new rule of including keyword args.. Save Image is no longer availabe in UV/Image Editor because of missing arg in "Edit Externally". Roel Koster (kostex) added a comment to T56250: Brush cycling with shortcuts broken. the changes to space_toolsystem_common.py got result in not being able to cycle through brush presets. Roel Koster (kostex) committed rBACf1066347ab84: mesh_selectbuffer: Update to 2.8 (authored by Roel Koster (kostex)). Roel Koster (kostex) committed rBACb4496a81e4f3: object_mesh_versions: Update to 2.8 (authored by Roel Koster (kostex)). Roel Koster (kostex) committed rBACee1e3a2f6e13: render_renderslot: Update to 2.8 (authored by Roel Koster (kostex)). Roel Koster (kostex) added a comment to T55475: Crash due to zero uniform buffer binding for sssProfile. So far I can say it's a stable build regarding this issue! 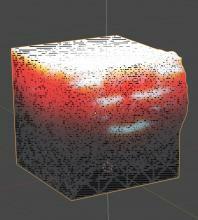 Roel Koster (kostex) added a comment to T56132: Blender 2.8 Crashes a lot on segmentation fault 11 (on Macbook Air). Roel Koster (kostex) raised the priority of T56132: Blender 2.8 Crashes a lot on segmentation fault 11 (on Macbook Air) from Needs Information from User to Normal. Roel Koster (kostex) created T56132: Blender 2.8 Crashes a lot on segmentation fault 11 (on Macbook Air). That's what you get when dealing with noobs ;-) Sorry..
on AMD Radeon R9 M395X 4096 MB (OSX iMac 5k) the proposed Viewport Samples and viewport quality "fixes" the issue. However in Eevee Render Preview and enabled screen(space)_subsurface_scattering, viewport still acts up. Roel Koster (kostex) created T55915: DOF Number of blades wrong logic. Roel Koster (kostex) created T53182: Cancelling Render clears the image when Save Buffers and Noise Reduc is on. 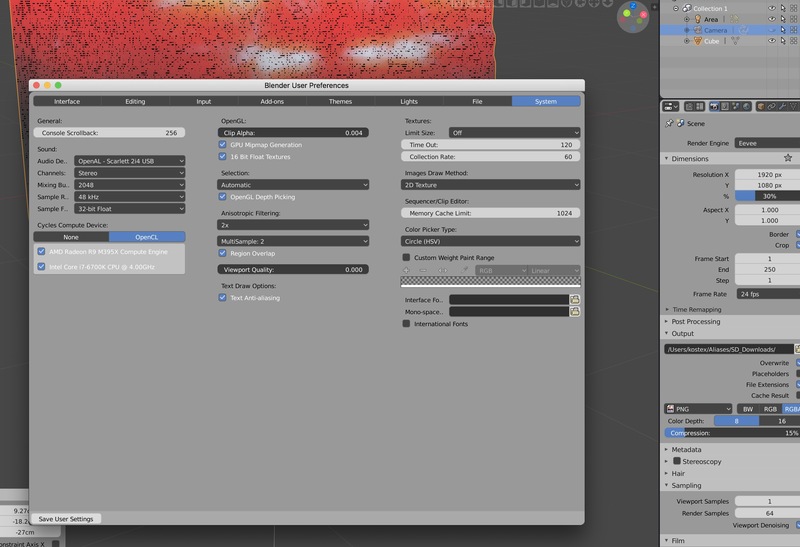 Roel Koster (kostex) added a comment to T52145: Denoising feature. Bug on GPU render (Mac OsX 10.11.6). I have the 'same' issue, except that the rendered tiles on GPU are completely black. No artifacts. Roel Koster (kostex) added a comment to rBdc6fcb8ecff4: UI/floats: Reduce our UI_PRECISION_FLOAT_MAX by one to avoid most rounding…. but the same goes for rotation as it does for translation. A user doesn't care how or what is being calculated under the hood.. he/she just sees an unexpected change in his input field. That's going to raise bug reports for sure and to my mind, rightfully so. So I would urge you in advance to try to overcome this 'faulty' display of rotation. When entering Rotation values higher than around 14.4, and reentering, those still get rounded with 6 decimals. So entering 14.1 is ok, 14.2, 14.3 works fine.. but after that the rounding occurs.. I've checked several lower numbers.. couldn't repeat the issue there.. strange..
Roel Koster (kostex) created T52066: Grid Mesh "generate uv" does not create correct UV's. Roel Koster (kostex) added a comment to T51989: Image Texture Node misbehaving. Searched like crazy to pinpoint where it goes wrong. Only the node itself displays "1"
Roel Koster (kostex) created T51989: Image Texture Node misbehaving. Roel Koster (kostex) created T51978: Setup Tracking Scene after Motion Tracking fails the first time. Roel Koster (kostex) committed rBACb55b7a8b520d: render_renderslot: updated bl_info (authored by Roel Koster (kostex)). Roel Koster (kostex) committed rBAC245ab0aeb2f6: object_mesh_versions: updated bl_info (authored by Roel Koster (kostex)). Roel Koster (kostex) committed rBACdbb080bebde4: mesh_selectbuffer: updated bl_info (authored by Roel Koster (kostex)). Roel Koster (kostex) committed rBACad8093dd1e87: render_renderslot: wrong usage of class and added auto advance option (authored by Roel Koster (kostex)). Roel Koster (kostex) raised the priority of T51442: Compiling OpenCL program base: CL_DEVICE_NOT_AVAILABLE from Needs Information from User to Normal. The error is the same, but you're using the 2.78c release version, not a daily build after 24th of april. you can also try to cleanup all leftover kernels in ~/.cache/cycles/kernels. For me that was no solution, but maybe for you it will. Roel Koster (kostex) added a comment to T51442: Compiling OpenCL program base: CL_DEVICE_NOT_AVAILABLE. Roel Koster (kostex) committed rBAC5dade847b827: render_renderslot: refactor/pep8 (authored by Roel Koster (kostex)). Roel Koster (kostex) committed rBACf222c4391eab: mesh_selectbuffer: refactor/pep8 (authored by Roel Koster (kostex)). Roel Koster (kostex) committed rBACab0aba23ce56: object_mesh_versions: changed cleanup mode behaviour (authored by Roel Koster (kostex)). Roel Koster (kostex) created T51449: High CPU usage when removing material from object. Roel Koster (kostex) created T51442: Compiling OpenCL program base: CL_DEVICE_NOT_AVAILABLE. Roel Koster (kostex) added a comment to T51421: KTX_Renderslot.py. Roel Koster (kostex) committed rBAC4a4a74c70309: Initial commit renderslot: T51421 (authored by Roel Koster (kostex)). Roel Koster (kostex) closed T51421: KTX_Renderslot.py as Resolved. Commited to contrib as "render_renderslot.py"
Roel Koster (kostex) created T51421: KTX_Renderslot.py. Roel Koster (kostex) added a comment to T51305: Crash on start. Roel Koster (kostex) added a comment to T51307: view selected doesn't work in this .blend file. If you would press R (for rotate in the viewport) you'll see where your object is located.. far to the left.. pan there and you're good to go..
Roel Koster (kostex) closed T51221: KTX Selectbuffer as Resolved.